Capasal Therapeutic Shampoo is prescribed for itchy scalp/ adult cap/ seborrhoeic dermatitis but I did not have a great experience with it. 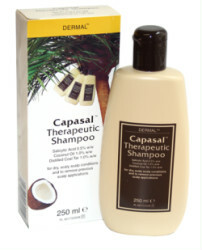 Capasal Therpeutic Shampoo contains salicylic acid, coconut oil and distilled coal tar. According to the label it is for 'dry, scaly scalp conditions and to remove previous scalp conditions'. It also contains triethanolamine lauryl sulphate. The Capsal felt like and lathered like ordinary shampoo, and smelled like coal tar, but not unpleasantly. It gave lots of bubbles but left my hair a bit too much on the squeaky side and quite dry. It costs £6.50 - £7 for a 250ml bottle. At the time I went to the doctors I had just started using the Jason anti dandruff shampoo and when I first switched to Capasal I didn't like it so went back to the Jason dandruff shampoo. But now I'm coming to end of my bottle of Jason shampoo and am back to the Capasal. Whereas the Jason shampoo has left my scalp absolutely fine, within one day of using the Capsal the funny scalp build up had come back. Now I know you are supposed to use the Capasal for a longer period of time before you start to see results, but the fact that I went from a pretty healthy scalp to a scaly scalp as a direct result of using the Capasal has put me off it somewhat. Since starting this eczema blog I've become more and more aware of different ingredients and have researched what people say about them. I know that many people say that coal tar can be a harmful ingredient, possibly carcinogenic. I'm not saying these products aren't safe to use, but it just makes me wary. If you already have extremely sensitive skin why would you want to use an ingredient like this? After all, shampoo doesn't just go on your scalp - when you wash it all off it goes down your back and face. Also all the bubbles in there are caused I think by the triethanolamine lauryl sulphate, a chemical detergent and I am wary about this as well. I've come to really like the Jason shampoo, and love the fact that it has all natural ingredients and is SLS free. I'm going to order some more online asap! I've not had a great time with this either, I find it smells like Turps(for removing paint), it also inflames my head even more and seems to strip absolutely every bit of moisture out of my head(which is the idea I think, to clean the slate). Anyway, a few months after using this I find my head is in no better shape and it only seems to aggravate my dry skin even more and make my hair feel like straw. This was recommended by a Pharmacist who inspected my head. No good results from using this. This was used along side a Olive Oil shampoo from Boots, which might I had is also not to great. So far I've tried PolyTar, CoalTar, Capasal, Simple, Johnsons Baby Shampoo, This Olive Oil brand plus a few others over the past year, to no avail! I think I'm going to try the Jason brand you blogged about.